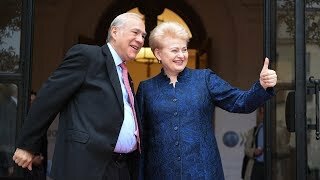 Monday, April 9, Paris – President Dalia Grybauskaitė met with Ángel Gurría, Secretary-General of the Organisation for Economic Co-operation and Development (OECD) and attended the OECD Council session that formally concluded talks on Lithuania‘s OECD membership. Lithuania began accession talks three years ago. They were finalized following the President’s presentation on Lithuania’s progress. Lithuania has implemented all essential reforms for promoting economic growth and enhancing people’s prosperity. At the end of May, the OECD Ministerial Council should take the final decision on Lithuania’s membership. It will become the 36th member of the OECD. According to the President, Lithuania is among the states that most rapidly implemented the membership requirements. This demonstrates our strong political will, huge effort and effectively implemented reforms. The OECD accession procedure alone brought real benefits for Lithuanian people. The OECD experts have made a detailed analysis of Lithuania’s situation in 21 areas; over 200 pieces of legislation have been reviewed and 50 laws have been adopted or amended. Dalia Grybauskaitė is of the opinion that OECD membership demonstrates Lithuania’s democratic and economic stability, final establishment in the list of the most influencial states and a strong voice in the international political arena. The membership opens up new opportunities for Lithuania: for example, this will involve raising Lithuania’s economic and financial ratings, stronger influence in the EU and other international organizations as well as a possibility to ask for assistance of the high-level OECD experts. The OECD applies the highest membership standards, thus Lithuania’s accession confirms its national advancement, reliability and stability. Lithuania is among the fastest growing states in the world. Last year, the national economy growth reached 3.8 percent of its GDP compared with 2.4 percent of the OECD zone and 2.5 percent of the euro area. Lithuania rates 19th in the Economic Freedom Index. It has the fastest wireless internet and is a regional center for financial and biotechnologies. The OECD was established in 1961 with the aim to speed up international economic recovery and trade relations between states as well as to enhance social protection of people.